Rabbit Hole Hay is a new company offering online shopping for some of the best farm-fresh alfalfa hay and timothy hay for rabbits, guinea pigs, chinchillas and other small animals. Rabbit Hole Hay provides small pet owners with access to nutritious, great-tasting hay – delivered straight to the customer’s front door, saving time otherwise spent traveling to and from the pet store. RabbitHoleHay.com is a new online store which specializes in selling specific hay types ideal for quality rabbit food, as well as an educational resource about hay for rabbits. 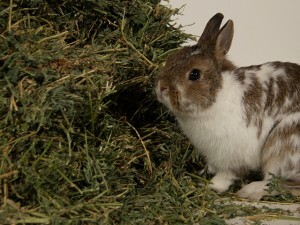 The company’s web site explains that alfalfa hay and timothy hay are the best types of hay to use for rabbit food. Alfalfa hay is ideal for young rabbits aged three weeks to seven months, because it is high in fiber, protein and calcium needed for proper growth. Timothy hay is best for adult rabbits, aged seven months and older. It has fewer calories than alfalfa hay and helps to maintain a healthy weight. According to Redman, most people can’t believe there are enough pet rabbits to even support this new business, but says they obviously aren’t aware of how many passionate rabbit owners there are, as well as owners of guinea pigs and chinchillas. New and current customers are encouraged to visit RabbitHoleHay.com to find an easy, informational, and even entertaining site where they can learn about each type of hay for rabbits, tips for rabbit care, and healthy nutrition for rabbits. The ordering process is simple and quick. The alfalfa hay and timothy hay is sold in one, five, 10 and 20 pound increments, is securely packaged in a cardboard box, and shipped directly to the customer.